In Someone’s Utopia, out now from Black Ocean Press, the poet Joe Hall examines the language of work and love. Hall is a New York based poet and teacher at SUNY Buffalo. For Hall, this is the next phase of an expansive and enduring project that he began with The Devotional Poems, published by Black Ocean in 2013. His poetry refracts the language around major general ideas in lived culture. The Devotional Poems looked specifically at the intersection of love, media ubiquity, and technological warfare. Hall examines the language we inhabit today with all its strange collisions and artifacts. The Devotional Poems emerge out of broken and faltering messages. It’s an assemblage of internet language, and the brutality of Abu Ghraib. Many of The Devotional Poems employ the affective register of prayer or psalm. Hall whips up frenzy. He uses sacred address, “fire, the spinning thaumotrope… I want to be… a terminal enveloped in your electricity, your boiler, a router…I can’t stop thinking about this shrapnel.” There is pastiche, and the sense of a descriptive pastiche expanding outwards. It’s a terrific collection and the first installment in a widening project. Someone’s Utopia turns more explicitly to the paradox of work. Work, like war, gives us meaning as it brutalizes. He presents this ambivalence in mundane descriptive language. The book is divided into several long sections. The first, Greetings: Play for 2 Voices, imagines various conversations between unnamed interlocutors. These include many references to mediums and the influence of automatic writing. In Séance, Hall incorporates texts that reference spiritualism, “Often a communicating spirit cannot/ hear the sound of the voice issuing from the trumpet and asks—antimnemnop precedeop—“can you hear me, can you hear me?” Emily Anderson describes the collection Someone’s Utopia as, “about the mystery of making…the book’s spectral labor is a séance.” It’s a book about voices. In these descriptions there is the voice of expertise alongside listlessness and wavering. This is work. John Henry Noyes, the founder of the Oneida colony, provides the base text for many of the poems in Halls collection. The poet erases and overwrites. The Oneida Colony was explicitly millenarian, believing that endtimes had arrived. It was founded in a Christian communitarian tradition that explicitly favored free love and polyamory. But people living in Oneida could have drastically different experiences, with many of these shaped by their position within shared marriages. 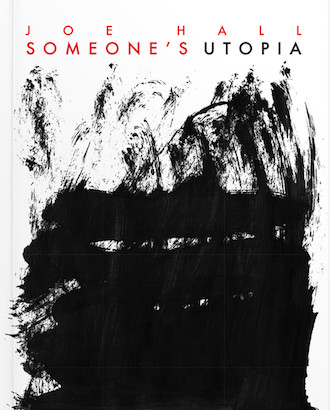 In Utopia Ltd, Anahid Nersessian describes the typical “someone” from Someone’s Utopia, as that within 19th century American utopian communities, free love rarely escaped fairly patriarchal schema. The sense of desire, around owning the shared, inevitably became another source of shame, locked up in the possessiveness of romantic love. This was a core paradox. According to Wayland-Smith, “Relinquishing selfish ownership of property meant nothing, John Humphrey Noyes insisted, unless Christians also relinquished selfish ownership, including sexual ownership, of persons in the form of marriage. Renouncing marriage meant renouncing the orthodox family and the western lineage. And this introduced the paradox of inheritance: the compulsion to survive and pass along information. The Oneida practice of criticism and radical detachment from society only bolstered the punitive elements of romantic love. Community members were publicly shamed and coupled in elaborate rituals. Oneida presents such an enduring example of utopian languor and eroticism, partially because, of course, Oneida itself persists. The heady romanticism of free love and mercantile industry in the late 19th century, transitioned into the familiar corporate industry of the 20th, and Oneida became a company. You can still buy the silverware produced in their factories. The story of Oneida has a lot of the same themes of Generation X rejecting the solipsism of the Baby Boomers for a different kind of solipsism, but an important piece to remember is that the ethic of industry was always there. And Hall describes the inevitable erotics of work. Hall captures a fascinating portrait of the tensions and small celebrations of working and loving in America. Oneida lives on, alongside these tensions. And Hall has produced a generous collection that can contribute to this ongoing conversation.